The starving dog found inside a zipped suitcase outside a Bronx apartment building is showing signs of recovery at the animal hospital where he's being treated, officials say. The 3-year-old pit bull mix, since named Fraggle, was so badly malnourished and in poor health that doctors had to administer life-saving medical treatment after he was found in the Melrose Housing Development at 700 Morris Ave. on Jan. 22. One month later, Fraggle has started to eat on his own and can even walk small distances without help, according to the ASPCA. It's a miraculous recovery given that he was perilously close to death when he was found, according to ASPCA Anti-Cruelty Group Senior Director Howard Lawrence. "Fraggle would likely not have survived much longer in the suitcase given his fragile state," said Lawrence. 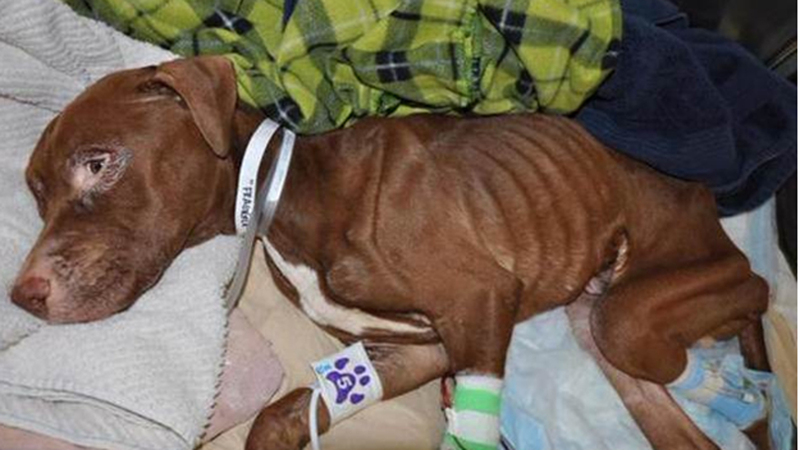 "This was a deliberate and callous act of cruelty that deserve justice." Fraggle will continue to recover at the ASPCA Hospital. In the meantime, a reward of $22,000 is still being offered by both the ASPCA and the NYPD for information leading an arrest and conviction in the case.